Luckily for me, I've had two extra days of holiday due to the snow finally falling in our county- time for sledging, snow ball fights, igloo making and (of course) an unexpected shoot opportunity! Dad: Humph, how long will it take? Me: Half an hour max, and I know just where to shoot it! Please? Dad: I need coffee, some caffeine!!! And then I need to get back to work. Anyway, thanks dad for taking some time off. Having self employed parents is certainly a bonus on an unexpectedly snowy day. So there we were, me in a floor length ball gown tramping up the country lane. "Ah, hello bemused neighbour. 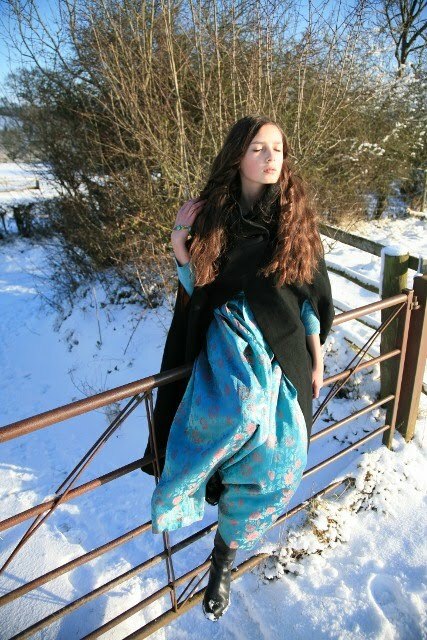 Don't you know I always go sledging in my finest dress daaaarling?" 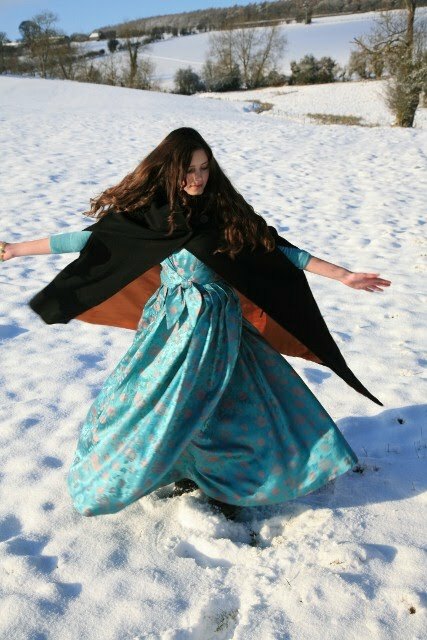 Then it was over a farm gate (yes, in the dress and cloak) and treading footprints into the new canvas of snow. This blue embossed satin dress with pink flower detail was bought by my mum at a jumble sale for about 20 pence when she was in her late teens. I want to find one of these jumble sales! But unfortunately I have a feeling they are already extinct- oh for the days when relatives gave away the rare pieces owned by late relatives. She bought it for a ball she was attending (although she ended up arriving with it accessorised with crutches, having broken her ankle two days previously.) I love the vibrant colour of this dress, and wish I had such an occasion to wear it to. I managed to weasel it into my wardrobe after coming across it in her box of vintage pieces hidden at the back of her cupboard (away from my vintage hungry fingers I assume.) But this collection of timeless articles has been somewhat depleted, and then, shall we say- relocated... in my direction. Of course it was so cold that I needed something very warm over the top, so in addition to the dress pulled over a matching cardi with 3 layers underneath, I also raided this rather delectable cape. It was originally owned by my late maternal grandmother, who liked to dress somewhat flamboyantly. She would match it with a floor sweeping gypsy skirt, a silver ring for every finger and bare feet. In winter! I think she originally found it in a charity shop too. The orange lining is silk, and the cape is wool. Unfortunately it is a little moth damaged. Although being a generally very peaceful person, the extermination of all clothes moths sounds like a promising idea to me. The black riding style boots are thrifted and the bracelet is family inherited. The little black bag is part of a growing collection of chain handled specimens working their way into my room via flea markets and that good old favourite- charity shops. Sadly, no more snow forecast overnight so I'm assuming it's back to school tomorrow. this is one of my favorites, Roz! 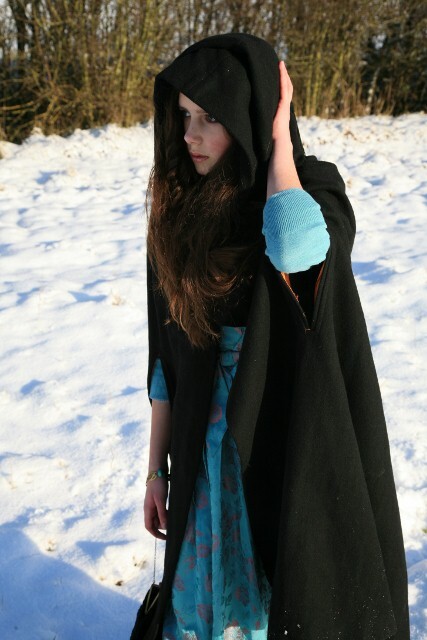 it's so pretty the way your blue skirt and sweater "match" the blueish shadows in the snow. sublime!!! i had a laugh reading the dialogue between you and your dad. my husband acts in a similar fashion when i ask him to do a "quick" shoot. What a beautiful dress! I wish you could buy more things like it these days. Most shops say they have vintage stuff when it really is just clothes from last year. Also, you're really lucky you got two extra days of your holiday.I'm from Scotland, but my school is open and I've had to go. If it isn't too much to ask for, could you follow my blog? beautiful photos, i love that dress on u! That first photo is stunning!! Love the dress!!! love the one of you spinning- gorgeous! ohhh goodness these photos are magical! Are you a modle because you could pass of for one any day your amazingly beautiful. Your pleading conversations with your dad/photographer sound remarkably like the pleading conversations I have with my husband/photographer. The difference is that my husband brings an industrial sized thermos of coffee, which somehow seems to end up in some of the shots. You look stunning in these shots and I admire your fearlessness in the cold and snow. Although there is a difference in our ages, you constantly inspire me. I always look forward to your new posts! I loved your new photos especially those of color, black and white though also have some lovely, of course. I'm a big fan of your work and your dad, I think you are ... "The Dynamic Duo" seriously. I still believe that your face makes you look like the model Lisa Cannot (which happens to be one of my favorites), especially for your big blue eyes, those are the same! Congratulations on your lovely photos! Love your photos,esspecially the third and second from last! That cape is to die for,amazing(Lovelove the hood on it),even if it sorta reminds me of the Scottish widows advert(not sure if thats a good thing! ).I always find that when I read your posts,I read it in like 2 minutes and then go "woah,I read all that".I dont know,its just I never seem to get bored with what you write!! Thanks for your comment, and the title is from Mowgli's Road. Really can't wait for her album to come out! wow, the first, second and last shot are just mesmerizing, roz! love them! also, how cool is it that your dad takes your photos! how does he feel about your blog and intense modeling skills? Love the emotion in your face in the first photo! what a fun thing to do on a snowy day! that cape is fantastic. wow! you are stunning darling. i love your style! following you! Beautiful dress! Your pictures are wonderful. Stunning dress and such fab photos! Heard that England has great flea markets/ thrift shops, have to visit soon! I heart vintage, palace, Jane Austen and the queen! U are so beautiful & U have a great blog by the way! Hi! This is my first visit to your blog and I just wanted to tell you I think you're wonderful! You have such a unique style, so much more interesting to look at than all the girls dressed in the same old ripped jeans etc etc. Keep up the good work! Oh also, yay another British blogger! I love these pictures...THEY ARE JUST AMAZING! Really stunning shoot, as always! I love the ones with the tree: it feels kind of fairytale-ish; also the third one and the one with the hood up! The little bag is just so adorable too!! your blog is so lovely! ELATION! Great shoot- that shade of blue + snow is magical.